The diva-like qualities, the extravagancies, the temper tantrums or rudeness which are usual amongst Hollywood stars have little in common with the way of being and thinking of the North American actor. The mega hero of celluloid (films) par excellence Viggo Mortensen (New York, 1958) became what he is thanks to Tolkien, who created the Lord of the Rings myth, and thanks to Peter Jackson, who turned it into a universal phenomenon. But he is everything other than a star. He turned up at the smart Orfila Hotel in Madrid with a cup for brewing and drinking Argentinean mate, dressed in jeans and a blue shirt which allows you to see, hanging around his neck, a Saint Christopher medallion, a shield of his football club San Lorenzo (a passion he never denies) and another of the peace symbol. He has bright blue eyes which are piercing, a touch cold, but not aggressive. He transmits confidence and closeness when he shakes your hand, very firmly. He could be a cowboy who has just got off his horse, and horses have been between his legs since he was a child when he spent many seasons on farms in Denmark (the country his father comes from), Venezuela and Argentina, where he lived up to the age of 11. He speaks Castilian (Spanish) with a gaucho (Argentinean cowboy) flavour and he feels very much at home in Spain where he has previously shot two films: Gimlet (1995) by José Luis Acosta and My Brother's Gun (1997) by Ray Loriga. He takes sits down unhurriedly, relaxed, and ready to chat openly, without apprehension or restrictions. He speaks slowly, in a soft, warm tone of voice; lights a Ducados (Spanish cigarette) and takes a swig of mate before starting to talk. Why did you accept an offer to come to Spain when offers in the USA were overflowing? That's what I was wondering before I came. I've always liked it and now, with more re-known and more projects on the table, that feeling hasn't changed. Especially if you receive a script like that of Alatriste, with a role which is so appetising and well-defined, and a solid, serious and interesting story, based on historic facts and capable of being entertaining. You are aware of the literary, musical and cinema novelties in Spain but did you know Pérez-Reverte's books? Not the books but the 17th Century, the Spanish Golden Century, which I admire. I've been a reader of history books since I was a boy and I studied Spanish history at school in Argentina. I immediately knew which context, ambiance and certain atmosphere belonged to Alatriste. That helped. But I have had to concentrate greatly to be (and act as) a Spaniard. I have studied the way of being, of walking, of sitting down... I had already observed the difference before, during other trips to Spain. Do you think that the acts of a hero like Alatriste can be understood today? One of the things which made me decide to do the film was the similarities between the present North American empire and the Spanish 17th century one described in the film, when the fall and discredit begins. The people in command do not take care of the citizens but demand total loyalty. Those people that go to war because of patriotic propaganda, joining the US army, go in the same way that Alatriste went to Flanders. Alatriste today would be a Sergeant in the Marines or another one of the Special Forces in Iraq who has not made officer because he is not diplomatic enough, he tells the truth and does not keep quiet when he sees something he doesn't like. But he is a noble sort who, like the majority of soldiers in Iraq, rather than to defend their country, goes to war as a social commitment. Would Alatriste have a problem with his conscience in Iraq? Of course. As happens in Pérez-Reverte's stories when Alatriste goes to demand an explanation from the Conde Duque de Olivares. Now he would go to talk to Rumsfeld and Cheney and demand to know the reason why many soldiers must die. Alatriste defines for the Conde Duque de Olivares what Flanders is: "A strange land, peopled by strange people who fear and hate us and will never give us peace". Iraq is the same for the USA! They are doing incredible damage. I admire Spain for having withdrawn from that absurd war. Do you not think that in fiction, but also in real life, people need heroes who fight fair causes? Definitely. People like to see them and dream of them, to be distracted. But anyone who thinks Alatriste is a cloak and dagger adventure story is wrong. It is much more than that. It is a subtle story, full of different readings and lessons. Although it is a big budget film and some will say that Tano [Agustín Díaz Yanes] has sold out to the production companies, it is one man's vision. Very artistic and worthy of careful attention because it has an important political lesson. It was called Indian Runner and it was Sean's debut as a director. The action takes place in 1968 and the lead character is a man who has returned from many years in Vietnam. He is a guy (like Alatriste) who was forced to go to Vietnam to get out of going to jail. He is also a mercenary with a delinquent past. Alatriste, although a loner, is more sociable and loyal to his colleagues. What are the differences and coincidences between Pérez-Reverte's character and that of Aragorn, the mythical hero in Lord of the Rings? There are swords in both... [Laughs]. But The Lord of the Rings is greatly influenced by the northern culture. Also Aragorn lives in a fantasy story. Alatriste has more to do with a Mediterranean culture, from the south of Europe, and has a large part of historical reality. Both characters defend their friends, are noble, take risks... and neither are great talkers, like me [more laughter]. Alatriste does not always behave correctly, he is crafty and breaks the law, and he lies to women and gets drunk. He even kills mistakenly, out of anger or jealousy, but he is more real than Aragorn, who always behaves correctly. Alatriste is a more real and darker story. Alongside it The Lord of the Rings is like a fairy tale. Who is a hero to you? Anyone, whether a sportsperson, an artist, a politician, a doctor, a worker, capable of giving something and of himself without expecting anything in exchange and who can rise to the occasion when he is not the winner. 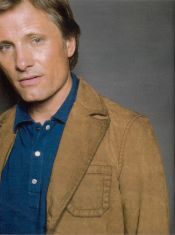 Viggo had already become, at the age of 45, a kind of steady film hero. As if the Lord of the Rings trilogy (2001 to 2003) were not enough, he then shot Hidalgo (2004), about a romantic rider who achieves a great feat on horseback, and A History of Violence (2005) by David Cronenberg, bringing alive an anonymous hero who is able to face up to thugs that breach the peace in deepest America. And to round that off, Alatriste. It is not a total break from the tough, mean roles you had been playing up until then? What I find curious is the fact I continue to receive good proposals after more than 20 years working. And each day they get better! [His first important role was in 1988 in the horror movie Prison by Renny Harlin who also directed Nightmare on Elm Street 4]. Other actors that started young are having more problems finding stable work after having a period of successful films. In this profession, as well as working hard and well, you need to be lucky. I've been very lucky since I turned 40. And did the bad guy roles never give you problems with your conscience? Yes, a couple of times. Like in the Sean Penn movie. But whenever I had to face up to a bad guy, I looked for the reasons he was bad (no-one is totally bad). If I could find those reasons, I took the role. A couple of times I turned down roles which displayed gratuitous violence. However the bad guy roles are nearly always better written, they are richer characters and are more interesting. A character like Aragorn can be so good it's boring. And don't you think that your physical appearance and those eyes have greatly defined your career? I imagine that you found early on that you had strength in your eyes which can be warm but can also be tough and icy, right? Well, of course, it is one of my resources. I think, mainly, I have been a hard-working and thorough actor, but I have had many years without a good role. Many times, I have taken what I was offered, anything... I have had to wait for luck, which came around five years ago, to encounter a coherent role, which gave me fame and money. All of a sudden I have a lot of work, and it's good, but during some years I just made a living. Is that why you are so multi-talented: photography, music, poetry...? Possibly if I had concentrated I would have been a better actor. But having other interests, other mediums of expression, has stopped me being neurotic and allowed me to be more relaxed, centred and helped me enjoy my work in movies. One of the privileges that you have had is to feature in the first films directed by great actors: Sean Penn and Kevin Spacey, who shot Albino Alligator in 1996. They were both slightly unsure, learning as they went along. The theory is one thing and carrying it out is another. You also need to get used to being the one in charge. It was a very good experience with both of them because they already know how actors work and the information we need from the director to do our work. Penn has had a colossal career. He has shown talent and, above all, he has chosen well. He is a privileged man, but he has worked at it. He has an impressive track record for his age. In 1993, you worked in Carlito's Way, by Brian de Palma, with Al Pacino, who many consider today's number one. What was that experience like? He is a very interesting man, with a great sense of humour, very hard working and, above all, very generous and humble. You learn a lot from people like him. I don't know if he is the greatest. I liked him best during his early stage, in films like Scarface, Serpico or The Godfather. Who were your Hollywood idols when you were starting out? Women like Meryl Streep. She made me dream of being an actor, and so I tried it out. Then, like most people, I took note of Marlon Brando and Montgomery Clift. But I still remain in ecstasy watching the work of actresses like Liv Ullman in Sonata, by Ingmar Bergman, that I've just seen. Are you a disciplined actor, one of those that just obeys the director or are you one of those that asks many questions, constantly needing notes from the director? Of the second kind... Any time of the day or night. I fry the director. I understand his work, which is very hard: answering all the actors, who are all insecure. I don't know how they can put up with it, after so much previous preparation, the exhausting work of filming! They really are our heroes! I would like to do it, I've thought about it, but I would have to push all the rest to one side and I don't know if I'm prepared or ready to do that. Born in New York, of a Danish father and an American mother, you lived far from the big city up to age of 11, on farms in Denmark, Venezuela and Argentina. Up to what point has such a wild childhood, close to the land and in the middle of nature, shaped the way you see the world? A great, great deal. Mother Nature is the first school. She makes you wise if you watch her. You learn the cycles and life and death. And you learn what it is to work hard from sun up to sun down (and get your hands dirty) and fight against (and with) the weather conditions. To live in Denmark and South America, and later return to the USA, made me learn there are many cultures, all very respectable, and many ways of seeing life. On the other hand, so much coming and going has left me without any roots (although I feel at home in many places) and has deprived me of good friends. Childhood friends. In truth, I miss that. When you were a child and rode horses in the Argentinean pampas, did you dream of being a hero? Who were your heroes? My hero was Martín Fierro, the mythical "gaucho" (cowboy) of Argentina, a mix of Spanish and native Indian who, by the way, also has a few points in common with Alatriste. He wasn't perfect either but he was brave, noble, avenging and defended his people. Not long after starting your career, in the mid eighties, you had two great frustrations that would have been capable of sinking anyone. Do you remember them? Would you not sometimes like to be offered a less intense, lighter role, like a comedy for example? I've never been offered comedy and don't know why. But sometimes I subtly slip ironic touches into my roles. Pay attention to Alatriste... I always find comic situations in the most dramatic ones. I have always said that there is only a step between tragedy and comedy, but yes, I would love to do a classic comedy, with witty dialogues, fun and apparently light.